ST. GEORGE — On rare occasions, that tortoise you encounter in the Red Cliffs Desert Reserve may not be what you think it is. Instead of a wild Mojave Desert tortoise, you may be looking at someone’s former pet. Last week, two Sulcata tortoises, also known as African spurred tortoises, were removed from the reserve following reports of the non-native species being found there. Lacey McIntyre, the reserve’s outreach and administrative coordinator, and her husband found one tortoise on the Owens Loop trail, while a trail steward found the other on Gap trail. Staff members were able to identity the tortoises as non-natives thanks to pictures of taken of them. People who see tortoises within the reserve that don’t look right are asked to contact the reserve so staff can investigate, McIntyre said. Staff are asking those who have pet Sulcatas not to dump them in the reserve. “If you put one of those tortoises out there, there’s no way it’s going to survive,” McIntyre said. Sulcata tortoises make popular pets due to their mild temperament, but they aren’t built for life in the desert and do not have a great survival outlook if released to the wild. Unlike the Mojave Desert tortoise, the Sulcata tortoise doesn’t hibernate in winter and will likely freeze to death as cold temperatures roll in. “The Sulcatas are better built for an African savanna than the Mojave Desert,” McIntyre said. The Sulcatas can pose the threat of disease to the Mojave Desert tortoise. “We don’t want our native tortoises hurt because of this,” McIntyre said. The two Sulcatas reported to the desert reserve office, they were soon found and relocated. The Sulcata that McIntyre found has since been named “Barnabus Tortoise,” according to a Facebook post. 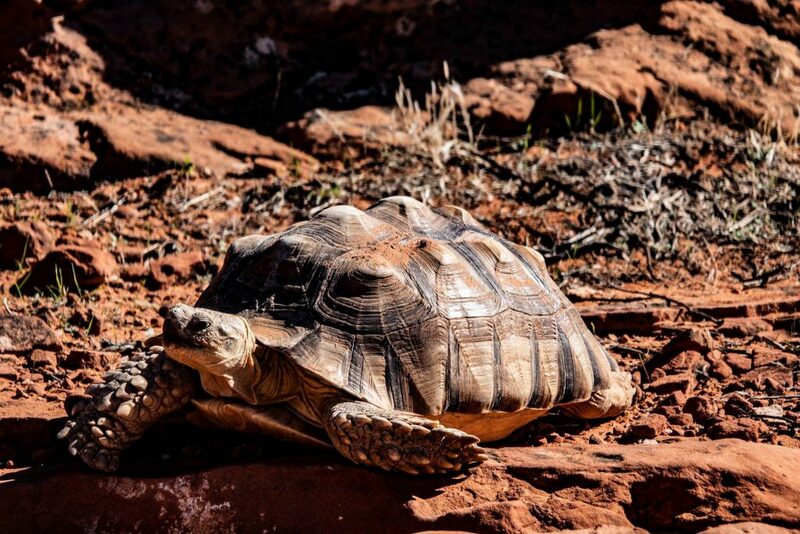 For those who may want to get rid of their pet Sulcatas, McIntyre encourages them to drop the tortoise off at the Red Cliffs Desert Reverse Office in St. George, or let others in the community know you’re giving the tortoise away. There’s bound to be someone in the community who be willing take the tortoise, McIntyre said. 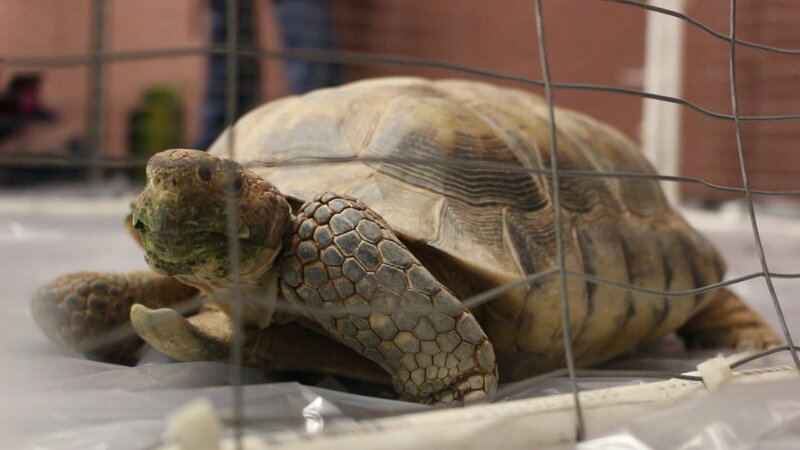 While dumping pets in the desert reserve can be an issue, McIntyre said its far more common for people to poach Mojave Desert tortoises out of the reserve, which is illegal. Some people don’t even realize they’re breaking the law by attempting to make a pet out of desert tortoise, McIntyre said. People who have taken tortoises out of the reserve are asked to return them to the desert reserve office, no questions asked, McIntyre said. The desert reserve staff would like to be able to test the returned tortoises for any possible signs of disease before reintroduction into the reserve’s tortoise native population. If you see a strange tortoise in the reserve, have a Sulcata tortoise you want to drop off or need to return a Mojave Desert tortoise, contact the Red Cliffs Desert Reserve at 435-634-5759. The office is located at 10 N. 100 East, St. George. Those who come across a tortoise in the reserve are also asked to take a photo of it and email it to info@redcliffsdesertreserve.com or the reserve’s biologist Mike Schijf at mike.schijf@washco.utah.gov. Those were the only turtles in the reserve.